The all-new, Canadian-built RAV4 delivers fun, comfort, style, versatility and performance, at a new, lower starting MSRP. (TORONTO, ON – January 17, 2013) Canadian drivers love the Toyota RAV4’s winning combination of fun-to-drive spirit, versatility and efficiency. Now they can get more of what they love as the RAV4 is poised to reinvent the category it helped create, with inspired styling and performance designed to help Canadians enjoy more time at play. The next-generation RAV4 features a new transmission, available dynamic torque control, and other upgrades to improve performance and handling, more cargo capacity, a premium interior, and more. Powerful yet efficient 176 HP 2.5L 4-cylinder engine / New six-speed auto transmission with sequential shift mode / Sport, ECO and normal drive modes. Choice of front-wheel-drive or all-wheel-drive system. All-Wheel Drive models are the first Toyotas equipped with Dynamic Torque Control, which enhances performance, fuel efficiency and driver control. With rear seats folded down, enjoy an increased cargo space of 2078L. New lift-back rear door / Lower loading height. New audio system with available on-screen easy-to-use Display Audio. Class-leading eight airbags and all of the features of the Toyota Star Safety System. Available technology includes: Rear Cross Traffic Alert, Lane Departure Alert, Blind Spot Monitor, Automatic High Beam System, Back-up Camera. 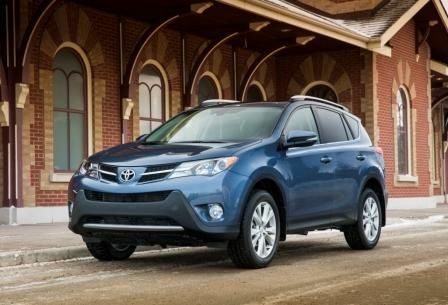 The 2013 Toyota RAV4 goes on sale at Toyota Dealers across Canada this February. For more information on features and specifications, visit www.toyota.ca/rav4.